Thank you to Trusty Biker for writing the walk through! So when you drop down, they’ll play a short scene about the Might Arrows Action Force (a light will shine up in the air featuring them). Then go inside and click start. The guy next to you tells you whoever comes up with the best Omegon costume will win a walk-on role in the Mighty Action Force sequel. Cool, right? Wrong. The person to the left of him tells you that nobody knows what Omegon looks like. Looks like we are going to have to find out for ourselves. Go right to the EXPO FLOOR. Keep going right and you’ll bump into the person from Wicked Cool News. He wants you to be a spy and figure out what Omegon looks like. He says if you find out, he’ll whip you up a super cool Omegon costume. He’ll give you a cell phone to take pictures of the Omegon costume. If you examine it now, you’ll ind out that we need to find three parts of his costume. The head piece, the suit, and the cape. Lets start! Go to the right and talk to Stan Ditko, the creator of the Elf Archer. You ask if he knows where you can find pictures of the Omegon costume. He says that someone was just here trying to sell me on behind-the-scenes shots of Omegon. When you ask who tried to sell you the photo, he’ll say it was Sasha Capone, the webmaster of Wicked Cool News’ biggest rival, Totally Rad News. Ask what she looks like and he’ll describe her, then you see her run into the hallway. Before you follow her, go right and pick up the FREE ELF ARCHER ISSUE #1 REPRINT. Now go left and enter the hallway. Now this part is very easy. All you need to do is locate Sasha Capone, figure out what door she went through, and then enter that door. It’s actually not that hard, you just need to figure out where she is at the very beginning. When you finally get to the end, go left and talk to her. When you tell her that you’re looking for pictures of Omegon and that you heard she has one, she asks what you’ll give her for it. Tell her that you could get some loose change. Then she’ll tell you to call her when we get a real offer. She’ll give you her card. Then she goes away to the closed door preview. Go left and click on the phone bin. Unfortunately, we don’t know which phone is Sasha’s. Let’s try calling her. Go to your inventory then use the calling card. Rats! No signal! Talk to the man next to the phone box. He says there’s a tech lounge down the hall. So go right and up to the tech lounge. Call Sasha again and this time, her phone will ring. Get there before it stops ringing and click on the bin. You’ll text yourself the photo and you’ll get a picture of Omegon’s cape. Now’ll we’ll get the headpiece. Exit the hallway and go left into the exhibit hall. Wait for the little scene to play out. Here’s a crazy idea. Let’s dress up as the elf archer and get in! Exit the exhibit hall and go back to the hallway. Go up to the tech lounge and customize the Pinata Man’s tunic. Exit the hallway and go to the platform above Stan Ditko. There’s a lady there that looks like a detective-type person. Customize her hair. The go left into the theater and go to the left side of the stage. Customize the sitting guy’s mask. Exit the Theater and go right to the Demo Area. Go all the way to the right and customize the knight’s bow. You can customize the arrows too if you want. Go back to the exhibit hall and stand on the platform. The people will push you into the room. As soon as they’re gone, Go to the left. You can customize any of the costumes there. Jump on top of the trash statue and onto the platform. You’ll see the new Omegon mask. You’ll take a picture of it and then you can get out. 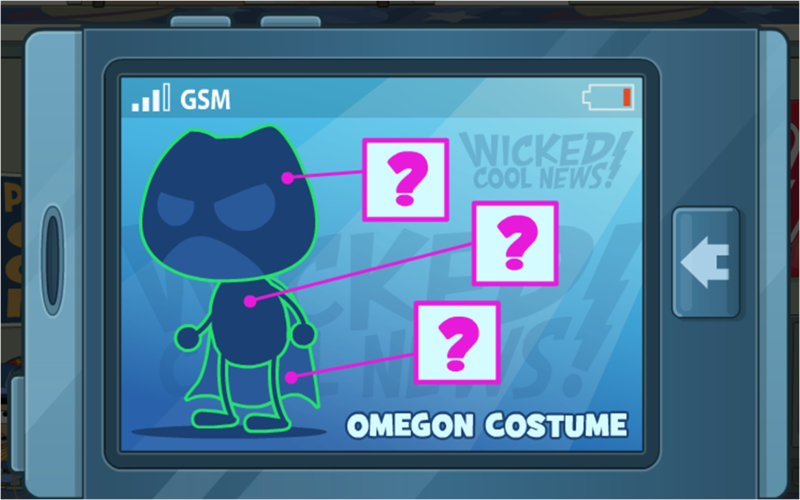 Now for Omegon’s suit. This part is just a little bit difficult and a little bit long. Go to the demo area and click on the girl by the Mighty Action Force Card Game booth. Say yes when she asks you if you want to play. She’ll teach you how to play, but I’ll explain it to you quickly. Once you beat the person (it may take you a few tries) she’ll give you a World Guy Card that’s worth 4 points. 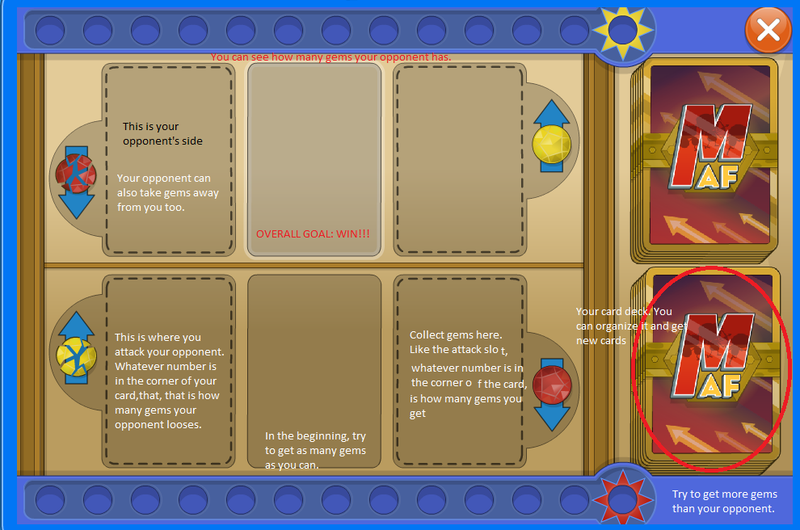 If you want to organize your card deck, you go to your inventory and press ORGANIZE on your Card Deck. You can switch out one of your lesser cards for that World Guy Card. So now we’re going to have to get a strong card deck to beat the person that has Omegon’s suit. Go to the right and click on one of the balloons so that you’re holding it. It’ll help you jump higher. While holding the balloon, jump up onto the higher platform. Go to the right until you see a board that’s full of sticky notes. Keep clicking on the board to make the sticky notes fall down. When they are all down, you’ll see a Mighty Action Force card. Pick it up. It’s a DIRT CLAUDE card!Now we’ll get a couple more cards before we battle the next person. Exit the Demo Area and go right and up to where we got the Elf Archer’s Mask. While holding the balloon, jump off the left side of the platform. If you do it right, you should get a Mighty Action Force card. If not, keep trying! It’ll be a Trash Collector Card. Now go right into the Exhibit Hall. You’ll notice a giant superhero at the top. There’s a Mighty Action Force card in his hand. Use the balloon to bounce off his hand and shake the card down. It will be a Fashion Ninja Card. You can now pop the balloon by clicking on it. You don’t need it anymore, the rest of the cards you can get without it. Exit the Exhibit Hall and go left into the Theater. To the left of the stage, there’s a platform with a box on top of it. Click the box to move it and you’ll find a Mighty Action Force card. Now go to the right and click on the girl with a peace sign necklace and challenge her to play. When you win, you’ll get a Gold Face card. Now, you’re going to want to go back to the area with the Tech Lounge. Go up to the Tech Lounge, and click on the vending machine that the wizard-dressed guy is having trouble with…again. A Mighty Action Force Card will drop out! Organize your deck, and try to have the most powerful cards, or the ones with special abilities, to be in your deck. Go down, under the Tech Lounge, and talk to the guy sitting down. Challenge him to play a game with you. Once you beat him, you’ll get an Elf-Archer card! It’s worth 4 points. Go back to the Demo Area now. Click on one of the balloons and go all the way up to the second platform. Organize your deck one more time, then challenge the lady up there to a game. When we win, we get an unreleased Omegon card! It has his suit on it! Now we have all 3 pieces! Go back to the Wicked Cool News booth. The guy will thank you, then give you an Omegon costume. When you’re ready, customize all parts of it,then head into the theater, and watch the cut scene play out. Once it plays out, you’ll get the Island Medallion!